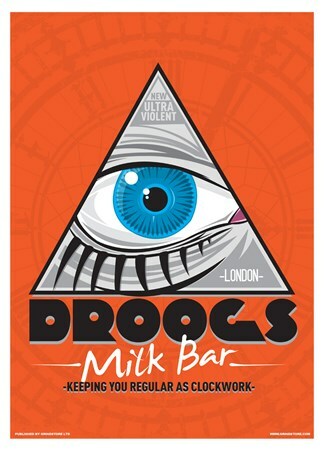 Film Mini Poster: This awesome poster is inspired by Stanley Kubrick's 1971 motion picture - A Clockwork Orange. Originally based on the British novel by Anthony Burgess, this story shocked audiences around the world and its reverberations are still experienced in today's society. This poster depicts a bright blue eye in a triangle, which is situated upon a faded clock with the slogan: "Keeping you regular as clockwork". The milk-bar scene in the story is an iconic moment as one can order a glass of milk laced with drugs as it is dispensed from figurines of women.